What if the former Icelandic prime minister could have seen his future self at this moment, years ago? Would he have made the same decision? And hadn’t he been able to predict he was taking a huge risk by sheltering his money through Panama? Had not Kodak, the inventor of digital photography, as early as the year 2000 been able to foresee that holding on to their rolls of film would take their company to the brink of bankruptcy? And had I not been able to see the beer belly I have now coming…? Why do we—often against our better judgement—not take good care of ourselves? Psychology professor at Harvard University, Dan Gilbert, ponders this very question; “The human brain is the only object in the known universe that can predict its own future and tell its own fortune. 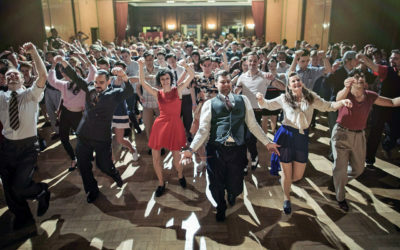 The fact that we can make disastrous decisions even as we foresee their consequences is the great, unsolved mystery of human behavior.” He has conducted research into how we predict our lives are going to change in the future: our musical preferences, our hobbies, our friends and even our values. Conclusion: we greatly underestimate those changes, we think we are done changing. And why? Gilbert feels this is in part because of the difference between our good memory and more limited imagination. Most of us will be able to recollect who we were ten years ago, but we have a much harder time predicting who we are going to be ten years from now. And we mistakenly feel that because we find those changes hard to imagine, they are not going to happen. Ideal conditions for embarrassing Panama interviews, Kodak moments and beer bellies. Words of wisdom from Johan Cruyff: “You have to get it to see it.” Alright, but what can I do to give my unique yet limited imagination for changes in the future a helping hand? And how do you get colleagues on board with innovating now for the future that is going to happen? Researcher Daniel Goldstein came up with a creative solution using virtual reality. But we will get back to that later. He once specialised in developing what are known as ‘commitment devices’. These are decisions you take now to limit a choice you face in the future, usually to control your impulsive behaviour. Like leaving your laptop in the office so you can’t work from home in the evening, or buying a smaller packet of biscuits because you know you are going to eat it all anyway. Or in Goldstein’s field of study: paying into your pension plan now for the future. “You are basically two persons: your present self and your future self”, according to Goldstein. Your present self listens to the here and now, wants to satisfy his needs immediately. Your future self also wants to live and would like your present self to be a little wiser. So, opposing interests. The power of Now vs the importance of Future. Neuroscience research at Stanford University also shows this separation between your present and future selves. You are using different regions of the brain when you are thinking about yourself in the present or in the future. And those latter regions are also activated when you are thinking of somebody else. You really see your future self as a different person. And subconsciously, this greatly influences your behaviour. Research subjects with the biggest differences in brain activity, were also most to choose the immediate rather than future rewards. Back to Daniel Goldstein. He looked for a smarter way than commitment devices, which a clever person could talk himself out of. Because we apparently find it difficult to see our future self as really ourselves, he decided to lend subjects a hand with virtual reality. 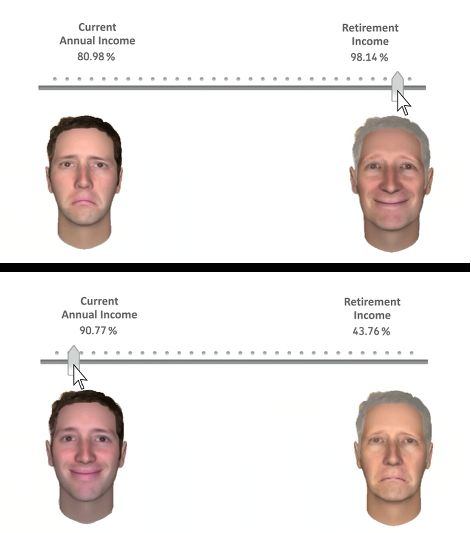 In one of the four experiments they got to split some money between a computer animation of their face as they look now and that of their older, future self. The more they’d pay into their pension now, the sadder their present self would be and the happier their elderly version. In the end all experiments showed that people exhibited more frugal behaviour if they were confronted with themselves in old age. A division of the Bank of America has put this idea into practice. 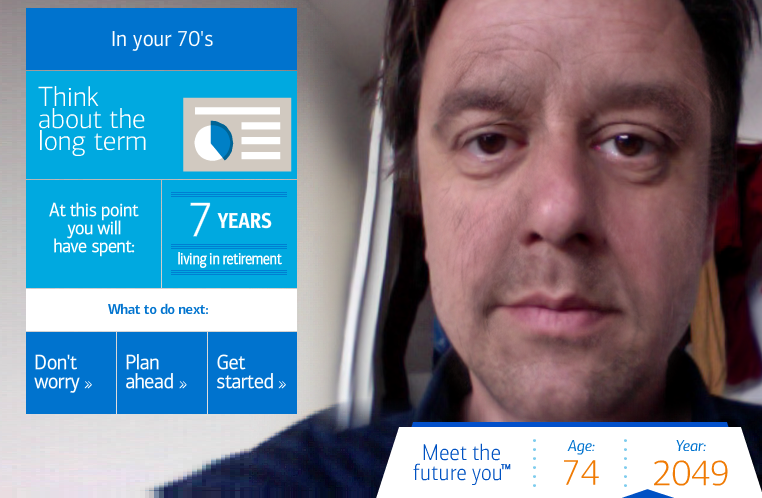 You can watch yourself grow older on their website. I gave it a try and I’ve got to say, I am not so sure it is getting them more clients, because after seeing the result I just wanted to get out of there as quickly as possible. You can try it for yourself. A friendlier version is offered by Orange, which even lets you talk and chat to the older you (see picture at the beginning of this blog). These new applications are in line with the tradition of Construal Level Theory. It describes how psychological distance has a certain influence on the thoughts and behaviour of individuals. Four dimensions determine psychological distance: personal distance, geographical distance, distance in time, and hypothetical distance, or in other words: me, here, now, real. The terrorist attacks in Paris are me, here, now and real. Climate Change is not me, not here, not now and not real. 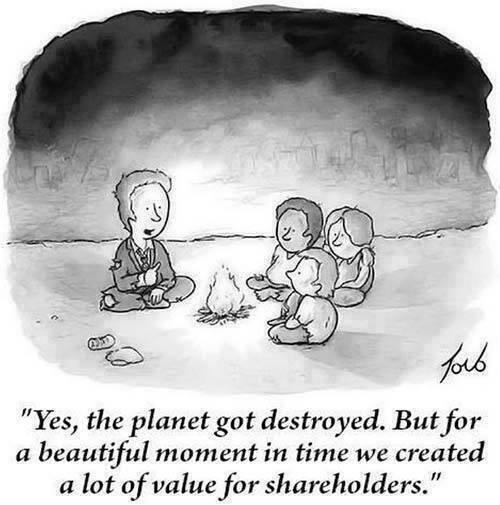 With this way of looking at it, considering climate change and human behaviour can lead you to some very interesting ideas. Former marketer and behavioural specialist Oliver Payne mentions infrared thermal-imaging of homes as an example in an interview with fellow specialist Arjan Haring. With spectacular effect in the United Kingdom. Residents purchased 8 times more insulation materials than in the previous year when they were getting five hundred pounds and tailored advice. In our Flywheel method for businesses we use these same insights. Here we take the abstract corporate strategies and make them personal and tangible through a series of challenges. We provide colleagues with concrete steps they can take NOW in their day-to-day work activities that contribute to the greater (sustainability) ambitions of the organisation and that are in the best interest of both their present and future selves. This ranges from creating an online compliment to a colleague, to a creative exercise for sustainable product innovation. You get instant feedback with each step as you carry them out. This brings out that good feeling of having mastered a skill, which is another potent behaviour mechanism. And yes they are small steps, but they are more effective and have better odds of succeeding than the larger steps your future self means to take next week but does not.